I had a dilemma this week – my crochet slippers developed some holes and I had the choice of finally giving up on them or mending them. A while back, Kate sent me some sheepskin slipper soles that are no use to her in tropical Australia and I plan to use these to make myself some brand new spiffy slippers at some point, but looking at my old slippers, I decided that there was still a bit of life in them and mending would be worthwhile. 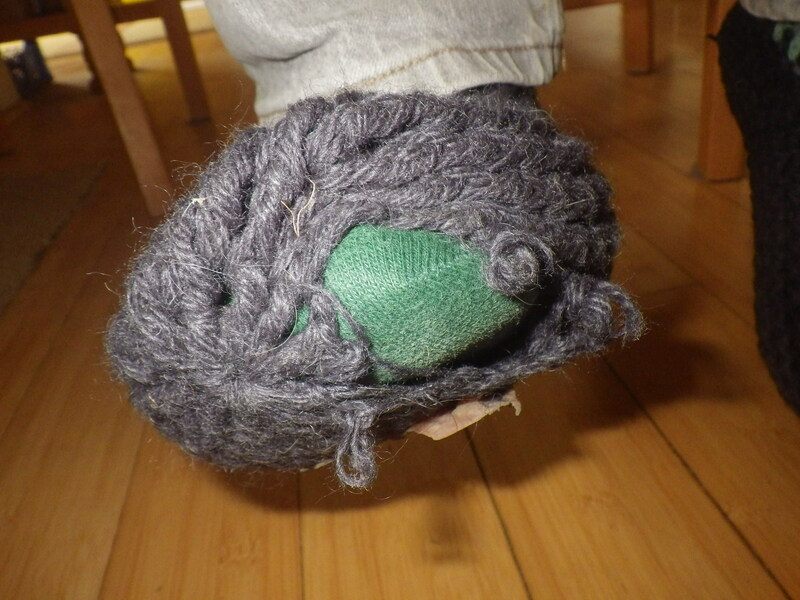 I did briefly toy with the idea of using the new soles to mend the old slippers, but actually the new pieces do not coincide entirely where the old ones are worn and, anyway, I have some ideas for the new ones… when I eventually get round to them. The original yarn was a mix of sock wool and some 100% wool chunky, but all the blue mends, including the latest three patches of darning, have been made using Axminster rug wool. The original company that I got the Axminster wool from went out of business, but I’m delighted to say that a new supplier, Airedale Yarns, has popped up. I haven’t ordered from them yet, but I can highly recommend Axminster wool for making slippers – it lasts so much longer than any other yarn I’ve tried for the job. So, my slippers live to be worn another day. I’m pondering whether there will come a point when there is nothing left visible of the original slippers… or , indeed, whether they will eventually become unsalvageable. Do you have items that are mended repeatedly? And when do you decide to give up on them? Then I made myself a pair, and then I made pairs for various people, all the time experimenting to find the best yarn for the job. 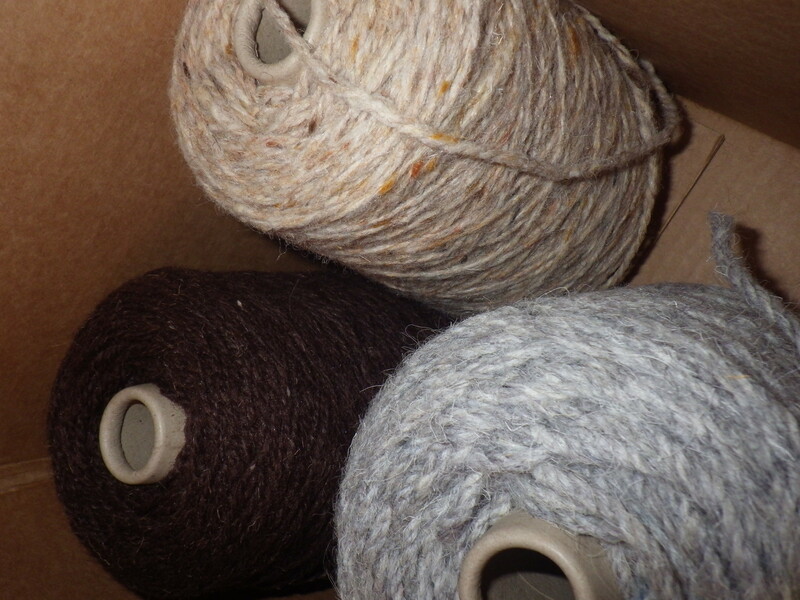 I finally settled on Axminster carpet yarn, which seems to be the most robust (as you’d perhaps expect). This does mean, however, that some of the early versions (including my own) were made with yarn that wasn’t tough enough for the job. Being gradually engulfed from the bottom up! 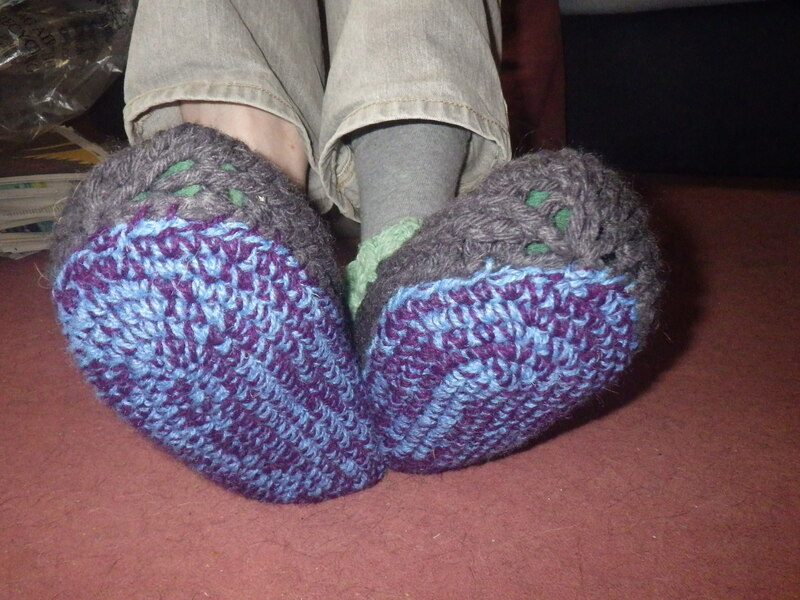 Gradually, my slippers are being engulfed by a layer of Axminster yarn. I wonder when they will become an entirely new pair of slippers that has simply ‘eaten’ the old ones. Have I got to the point where I am no longer mending, but creating anew? Sadly, the company that I used to buy my Axminster yarn from have recently gone out of business. I’m currently awaiting a response from the makers of genuine Axminster carpets about whether they might be willing to supply small amounts of yarn. If not, the days of making and mending these slippers may be limited. However, Kate Chiconi did send me a wonderful pair of sheepskin slipper soles and I have set these aside to make myself a new pair of slippers with some Berber carpet wool (limited quantity as again from the sadly departed supplier) at some point… another thing on my ‘list’! Do you have anything you have mended so much that it has now become unrecognisable? When I make something, I want it to last (unless it’s food). If I put hours into knitting or crocheting, I’d like the finished object to be used for years to come, so choosing the right materials to work with is very important. For example, I have learned that sock yarn is essential for hard-wearing socks – with the best intentions, a normal 4-ply is useless, as you’ll have holey socks in no time at all. 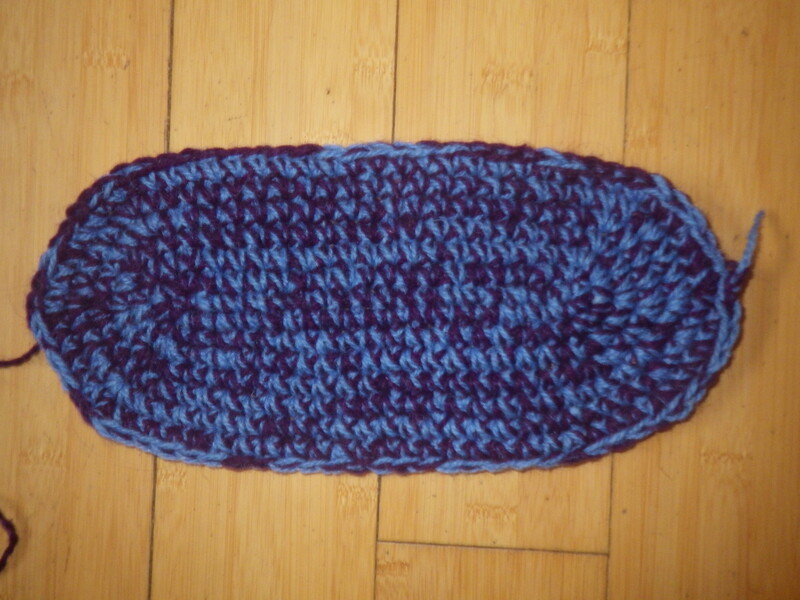 Making slippers has been quite an experiment in terms of finding the right yarn because, unlike socks, there is no yarn specifically designed for slippers. And, my word, does it need to be hard-wearing. Originally I tried out a variety of yarns, but finally settled on Axminster – the stuff they make carpets out of – because this is designed to be walked on day in and day out, just like a pair of slippers. 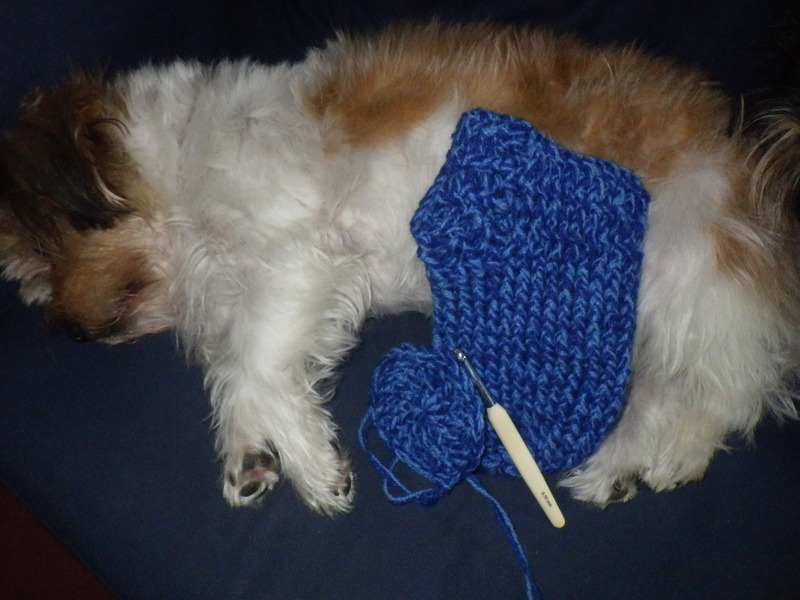 However, by the time that I discovered this yarn, I’d already made several pairs of slippers with other yarns. My own pair needed repairing some time ago – they are made with a combination of chunky 100% wool yarn and a couple of strands of sock yarn. Mr Snail’s were made from Pure Whitefaced Woodland Wool from Blacker yarns (no longer available), which has lasted about 15 months before wearing through. Mine had new soles a while ago, but Mr Snail’s slippers came in for the Axminster treatment this weekend. Rather than simply darning them (I hate darning), I made them complete Axminster soles, covering up the damaged part and returning them to functionality. The Axminster yarn contains about 20% nylon to make it much tougher than pure wool. Part of me really wants to use only natural fibres, but I have to acknowledge that the presence of nylon does make this yarn much more hard-wearing and, therefore, ideal for this purpose. I’ve written about yarn ethics in the past and I still struggle to find a perfect option in all cases. However, by choosing this particular yarn for this particular use, my work lasts longer and the slippers need repairing or replacing much less frequently, thus conserving resources and making the best use of my time. I think that’s as good as it’s going to get! What do you give as a gift to a glamorous young lady who works as senior cabin crew for a major airline? Perfume? Ear rings? A spa treatment? Well, apparently, none of those things… what she really wants is a comfy pair of crochet slippers! 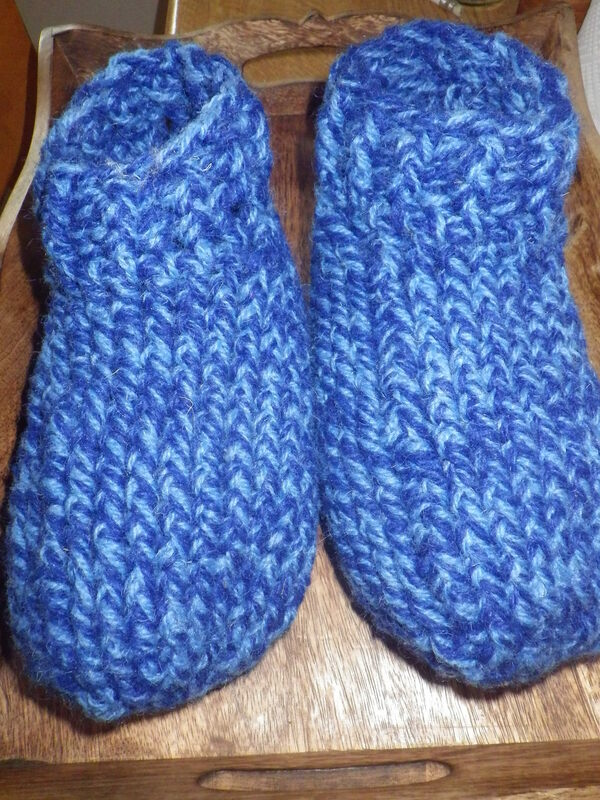 And so, last week’s task was making slippers in blue Axminster rug yarn from Texere – it’s very robust, but a little hard on the fingers! 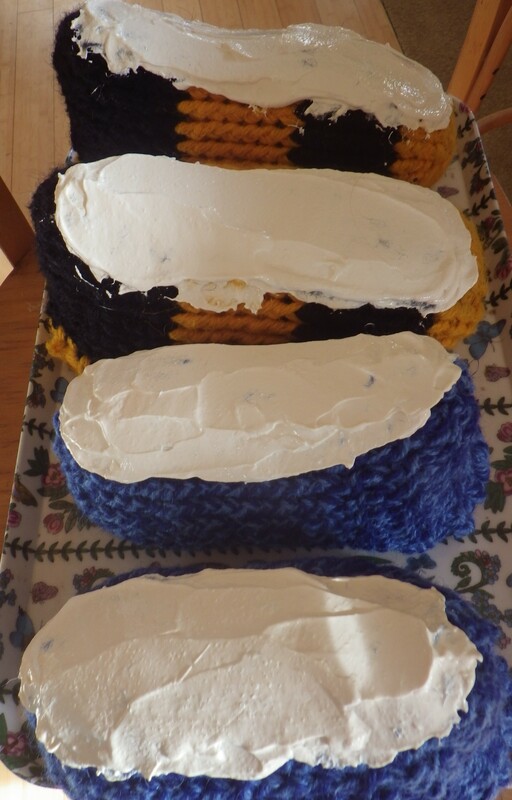 I chose to combine royal blue and forget-me-not to get a mottled effect since I needed to work with two strands, and I used my favourite pattern for these adult chunky slippers. I put a layer of latex on the bottom for extra strength and safety, and whilst I was about it I did the same for Mr Snail’s latest pair. I have found the value in this endeavour of adding some thickener to the latex, as this means the job can be achieved in one step without having to apply multiple layers. The only slight issue to remember is that it takes about three days to dry, even in a nice warm house! 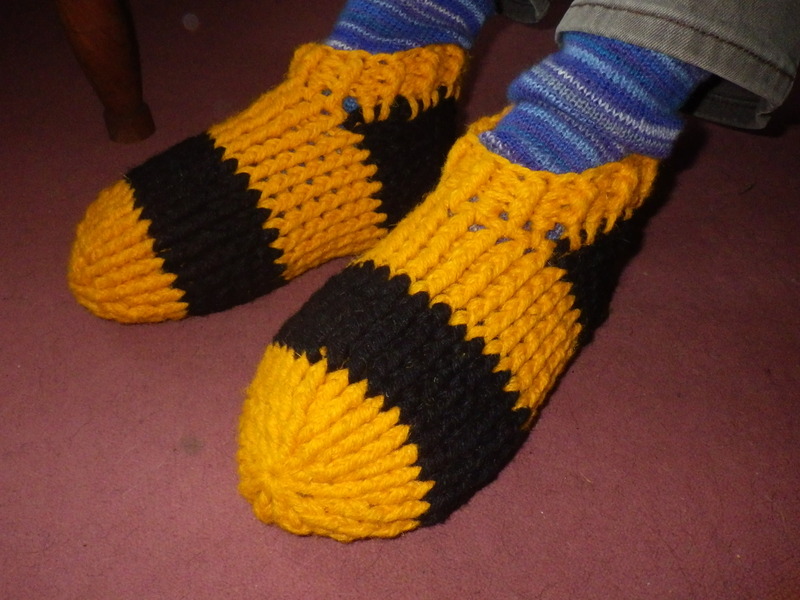 Now the finished slippers have been packed up and sent off… I really hope they fit and provide a winter of cosy feet!